Situated along the stunning Yucatan coast of Mexico, on the Caribbean Sea, our all-inclusive adult’s only resort in Cancun is an idyllic blend of traditional Mexican warmth and intimate elegance. Nestled along the glistening sands in Cancun’s Hotel Zone, Hyatt Zilara offers breathtaking views of the Caribbean Sea, exceptional dining and nightlife, and our signature Service From the Heart®. Our spectacular all-inclusive resort features beautiful suites, oceanfront pools, including a beachside infinity pool that winds toward the ocean and a pristine white sand beach. As part of our all-inclusive Cancun vacation packages, guests savor gourmet cuisine in 6 culturally authentic restaurants, beachside and from innovative food carts that roam the resort. Sip top shelf cocktails poured by expert mixologists at 5 bars and lounges and enjoy tequila tastings with our sommeliers. Arrive, relax and take it all in. It’s all inclusive. 20 minutes from Cancun International Airport, 15 minutes from downtown Cancun. Spice - buffet dining; Pelicanos - Caribbean and Mexican fusion cuisine; Asiana - Asian fusion cuisine and Teppanyaki (Reservation required); Maria Marie - Mexican cuisine; La Adelita Cantina - Mexican hors-d'oeuvres, tequila and mezcal cocktails served along with a variety of craft beer; Chef's Plate - chef-selected menu changes daily (Premium Suites); Casa del Café - coffee, tea, desserts, and baked goods. 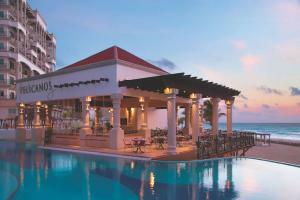 Dine around exchange privileges with Hyatt Ziva Cancun, subject to availability. Historical and cultural attractions such as open-air markets, ruins.